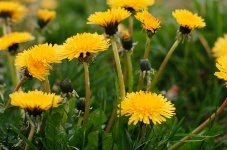 That lawn weed that everyone loves to hate—the dandelion—has some pretty incredible qualities when it comes to boosting your health. You might have noticed that dandelion greens have become popular enough that many grocery stores stock these veggies alongside the usual spinach and lettuce. Dandelion greens are high in vitamins A, B-complex, C, and D, and minerals including iron, potassium, magnesium, calcium, and zinc. And as for dandelion root extract—well, it’s able to offer help where no other treatment has when it comes to one particular form of cancer: pancreatic cancer. Pancreatic cancer is a frightening disease. It has a 100% mortality rate. There’s no pharmaceutical intervention that’s been successful in shutting down the rapid spread of this form of cancer. But just recently, researchers from the University of Windsor in Ontario evaluated the effectiveness of dandelion root extract in treating aggressive and resistant pancreatic cancer cells. What they found is very promising and inspires hope. The dandelion root extract induced apoptosis (cell death) in pancreatic cancer cells in a dose- and time-dependent manner—meaning the dandelion root extract went to work as soon as it was applied to the cells, and the more extract that was used, the more the cancer cells died. The dandelion extract killed off the cancer cells in an ingenious way: it caused the collapse of mitochondrial membranes, making it impossible for the cancer cells to survive. What’s more, normal, healthy cells were completely immune to this effect. The researchers are calling for more research to be conducted. For a health tip on how this special vitamin can help ward off cancer, read our article on this cancer-fighting vitamin. Ovadie, P., et al., “Selective induction of apoptosis and autophagy through treatment with dandelion root extract in human pancreatic cancer cells,” Pancreas October 2012; 41(7): 1,039–47.